I remember the day that Esther Louise arrived in Lyttelton a couple of years ago now. She is a beautiful 54′ Moody and was by far the flashest boat in the area that we had ever seen. I remember thinking then how much I would love to go on board for a look around, and perhaps a wee sail somewhere. Fast forward a couple of years. My friend Emily sent through an email. “I’ve been offered a week on Ester Louise in New Caledonia – do you want to come?” I think we had replied within seconds of opening the message to say “Yes of course!” Flights were booked, care for our various collection of kids, cats, dogs & bosses arranged, and finally the departure date arrived. Andrew, Naomi, Camilla and I jumped on a plane to meet Emily and Tim in Noumea. Esther Louise was parked up at the visitors berth in Port Moselle Marina. We arrived just after lunch time and quickly unpacked and made ourselves at home. Then we were off to the supermarket to provision. We greedily piled our trolley high with French wine bread and cheese. What a fantastic selection of food! The following morning we went to the market which was right next door to the marina and stocked up with fresh prawns, fruit & veggies, which were all carefully stowed on board before we headed out to explore. 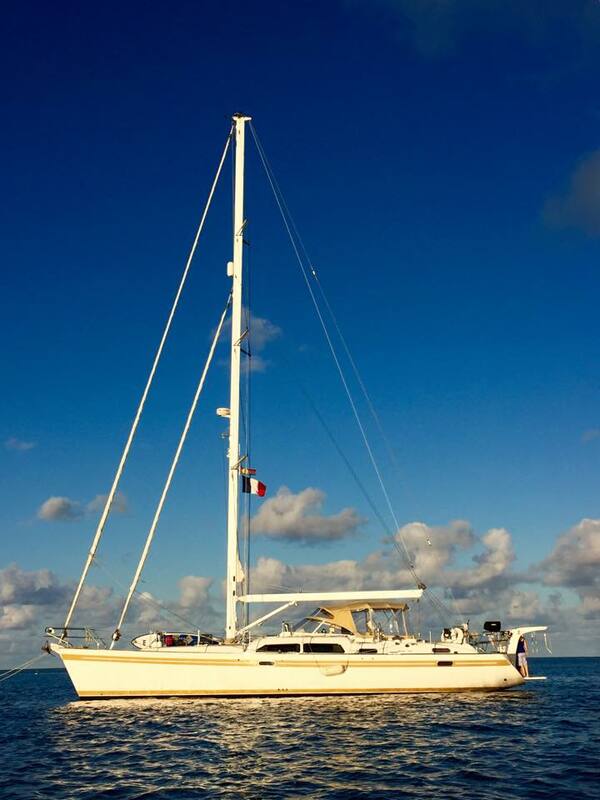 Our first anchorage was Ile Nge or Ile Larenge which was a short sail straight out from Noumea. On arrival the anchorage was packed with weekend sailors, but we still managed to find a mooring to pick up, and within an hour or so there were just three boats left. The weather was a bit windy when we arrived and so we didn’t go ashore that night, but we had a fantastic dinner of steak and prawns while watching the amazing sunset. We were up early the next morning to go ashore for a quick circumnavigation of this tiny island before taking Tim back to Noumea for his flight back to New Zealand. We made a quick trip to the shop to make some final purchases before setting off for the Baie du Prony. About 20 nautical miles south, via the Canal Woodin. Emily and Tim had been here for a week, and had already discovered some cool places. 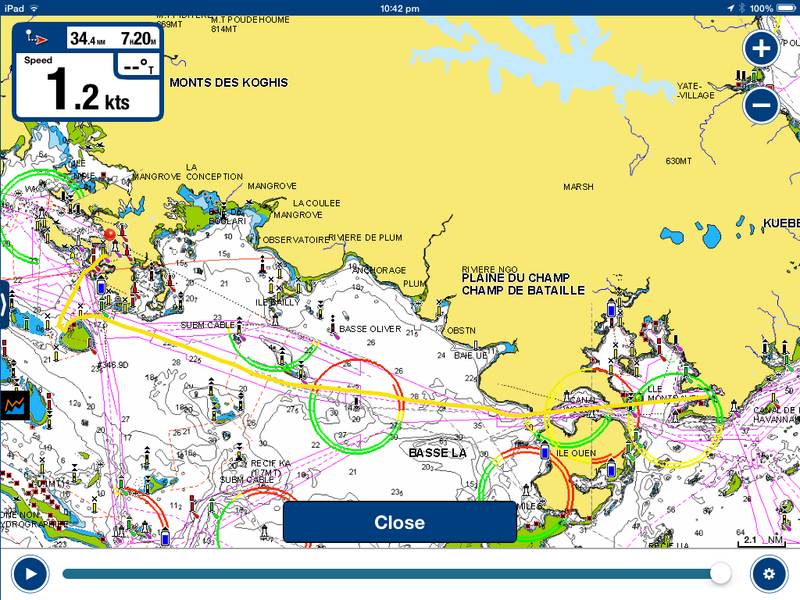 The Baie du Prony has a few different arms and various anchorages to explore. Our destination was Ile Casy to visit “Monsieur Chien” (Mr dog). Emily had met him the week before and was keen to go back. We picked up a mooring and Monsieur Chien was waiting for us at the end of the jetty. The island is a reasonable size, and there is a deserted hotel there covered in vines and boarded up, and this lonely old dog. We would love to know his story. How did he come to be here? He seemed very happy and friendly and proceeded to take us on a tour of the island. Stopping regularly to make sure we were still following, and occasionally wading in the water – looking like he was hunting for fish. The earth is really red and rich with minerals. The local economy is fuelled by nickel mining, and there was a big mine on the Eastern side of the Baie that we could see from the top of the island. Convicts also lived here at some stage and there are a couple of gravestones marking their presence. The next day after a quick swim and dropping some dinner scraps over to Monsieur Chien who was again sitting on the end of the jetty, we hoisted the main and started off towards the Ile de Pins (Isle of Pines). About 40 nautical miles South, and heading straight in to the prevailing SE trade winds. We motorsailed for 9 hours, picking our way through the many reefs along the way. It got quite rough at one stage, and when a wave came over the bow it found its way through a partially opened hatch and landed right on top of me reclining on the couch below. 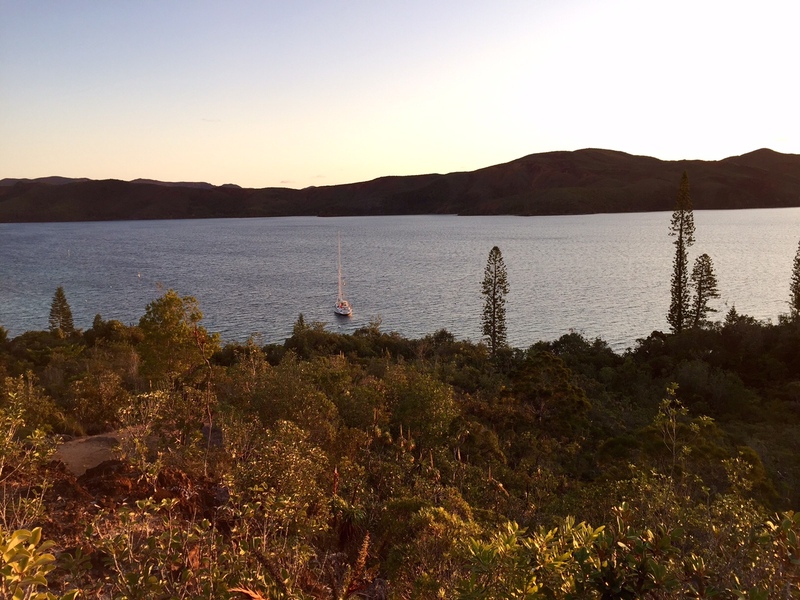 About 5pm we found a lovely spot to drop the anchor in Kuto Bay. With a lovely sheltered anchorage, squeaky white sandy beach, and turtles swimming around the boat, we decided that we would stay here for a couple of nights to relax and explore. 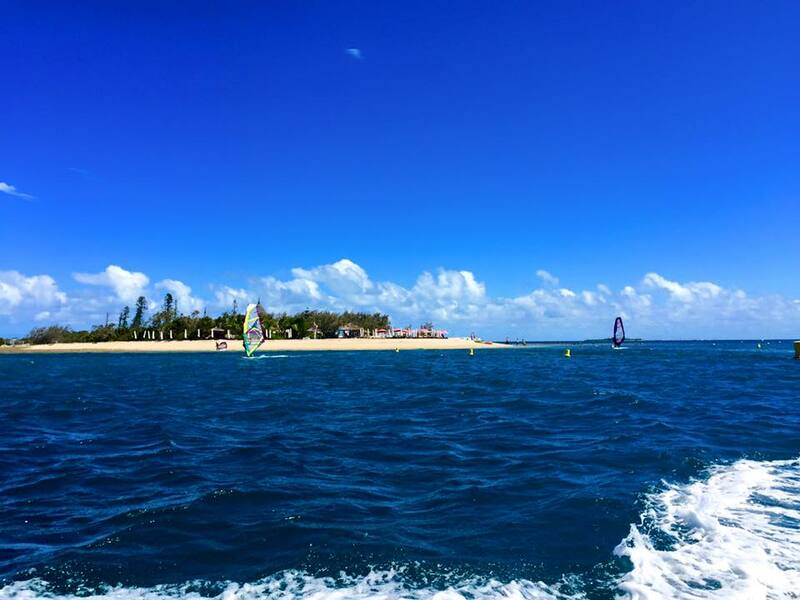 The following day was spent swimming, snorkelling, paddle boarding, exploring and sunbathing – ahhh paradise! Kuto Bay is quite sandy, but just across the road beside the beach you can access another bay that had fantastic snorkelling around the coral. Cruise ships visit this bay and there is a wharf built especially to dock the tenders coming to and from the ship. I imagine it would be a very different and busy place when the ships were in town, but when we were there we pretty much had the whole place to ourselves. We would have loved to stay longer and explored further afield. There are a number of anchorages around the Isle of Pines and you can also do a trip on a local sailing boat up to another lagoon. But alas we didn’t have enough time. We will have to come back. The following day we had a fantastic downwind sail. Just 6 hours all the way back to the Baie du Prony. 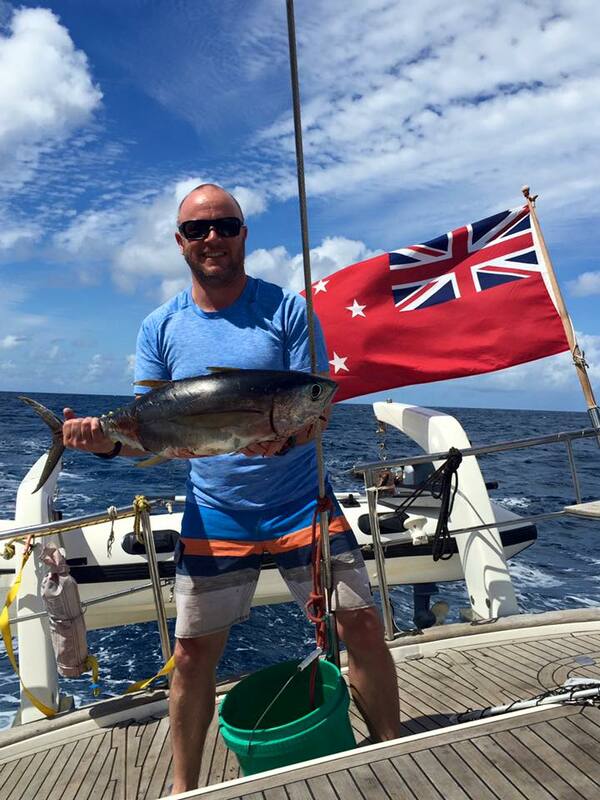 Andrew hooked a big tuna which created much excitement and entertainment reeling in the catch while Emily tried to stop Esther Louise from sailing too fast. We even saw whales breaching over and over again in the distance. Too far away to photograph. 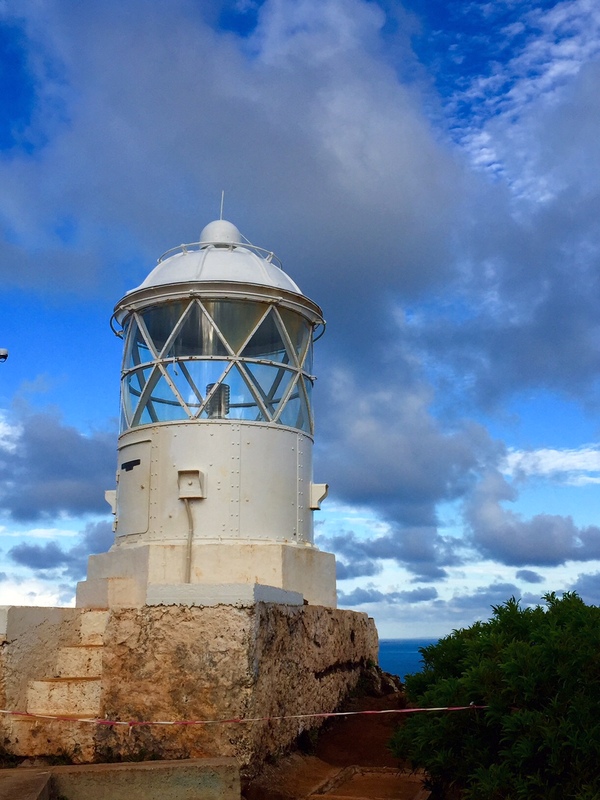 This time we picked up a mooring in Anse Majic and went ashore for a big walk up to the top. The track was steep but we were rewarded with a fantastic view from the lighthouse at the top looking right down to the Isle of Pines, through the Canal Woodin and all over the Baie du Prony. Just gorgeous. The only downfall was having to scrub the dinghy after the trip. The red soil is very difficult to get off white dinghies! We had to head back to Noumea the following day. Jay the owner of Esther Louise was flying in along with Captain Kimbo and Craig who were going to sail her back to New Zealand. In addition to this we needed to refuel, get the genoa off for some small repairs, do the laundry and get the gas bottles filled. 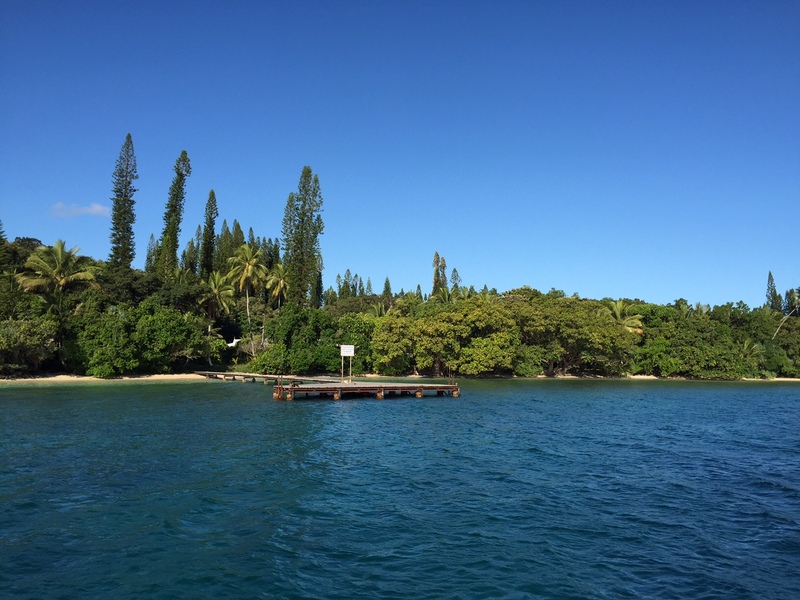 We set off early and took the opportunity to make a quick stop at Ilot Maitre, a small island just out from Noumea, for a quick dip before returning to the marina. The breeze was building, and it wasn’t getting any lighter as we arrived at the fuel dock. Thankfully we were able to tie up easily and refuel while we waited for a marina berth to become available. A number of other yachts came and went while we were sitting there, and we admired their boat handling skills both coming in to and leaving the dock with a strong cross wind blowing. Thankfully with these boats leaving, meant there was now some space in the marina, with the strong crosswind it was a tricky manoeuvre, but Emily did a great job and we were soon safely docked and began to tidy up. Jay, Kimbo and Craig arrived and we fed them some tuna sashimi and cheese along with a couple of beers before having a quick catch up with the girls from a Wellington boat “Gucci” and dinner at a lovely little French restaurant just up the road. Then all too soon it was time to go. Emily, Naomi & Camilla were flying home to New Zealand. Andrew and I had booked another couple of nights at Le Meridian. None of us wanted to leave Esther Louise. We’d all had such a wonderful time, but there was lots of work to do to get her prepared for her trip back to NZ. So we said our farewells and headed off in different directions. It was cooler that day, so Andrew and I explored all the shops around the hotel and watched the yachts and kite surfers playing in the water outside our hotel. We spent our last day on Ile aux Canard. This little Island is just out from the hotel and a short water taxi ride. There is a wee bar and restaurant on the island and there is a fantastic snorkelling reef just off the beach. We bought some lunch from the patisserie on the way to the water taxi and then spent the day relaxing in the sun, drinking beer and snorkelling. It is a lovely spot, but I secretly felt sorry for the tourists who only had limited options when visiting places like this. We had been lucky enough to taste life off the tourist trail – it tasted good! We want adventures off the beaten track. 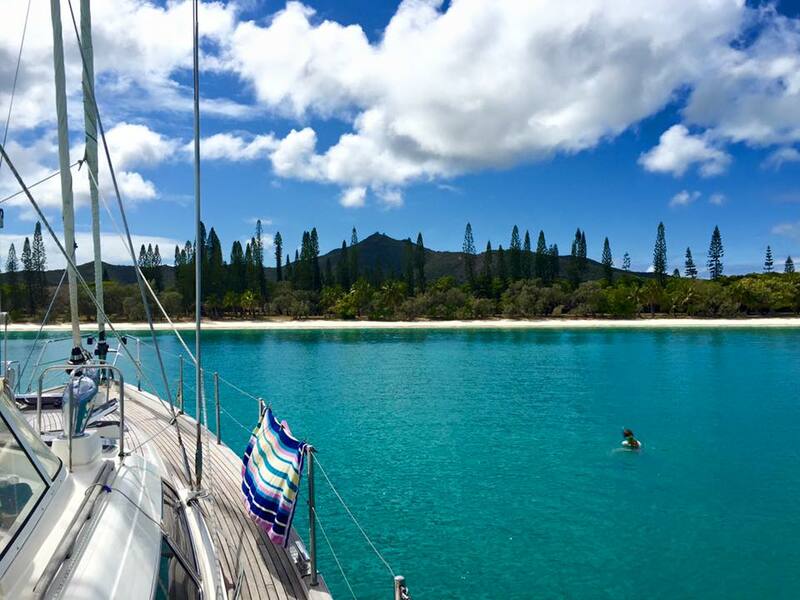 New Caledonia is a fantastic place to come and sail. We wished we could have stayed for longer and will definitely be back. Check out my other post with some cruising tips. If you come here without a boat, I would recommend getting a car and exploring further afield. Noumea is lovely but there is so much more to see. I believe there are some nice hotels further north. You must visit Isle of Pines too. There are flights and ferries and lovely hotels there too. 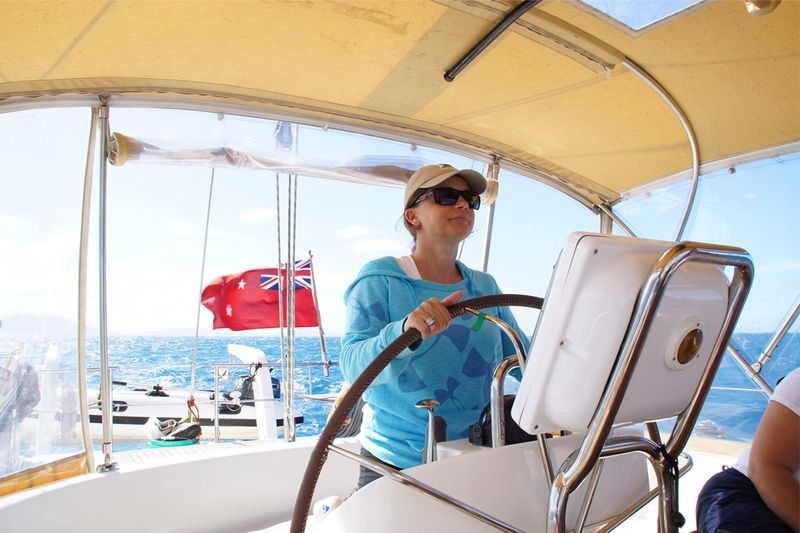 I also had an article about sailing in New Caledonia published in Boating New Zealand Magazine. Oops – hit reply too soon! … For when we give up work and cruise full time! New Caledonia looks a beautiful cruising ground. Pity you had to slum it on a Moody 54. What did you do with all that space? It made a wonderful dance floor! Yes, loved the video of the dancing and singing! So happy you had a good time! Another great story, Viki. Thanks for sharing your travel with us! Great post – looks like you guys had the most amazing time ever! This is a great one! I love your photos. And wow, New Caledonia looks great. Do you know what kind of cheese you get here in the Bahamas? You are overjoyed if you get shredded “Mexican blend” from Kraft or some such big company. And produce? It’s terrible. Lucky to get a good onion now and then.